Andrea Eccleston has seen a lot of changes with the Huskies football team over the past 16 years, including the field’s conversion from grass to turf, and the evolution of no fireworks to, well, plenty of fireworks. By day, she serves as the environmental programs co-ordinator at the School of Environment and Sustainability, working with prospective and current students, and faculty in the eight environmental undergraduate degree programs on campus. After hours, however, she hits the turf as equipment manager for the Huskies football team—a volunteer opportunity that came her way in 2000 after working a similar gig with her high school team in Maple Creek, Saskatchewan. "They were looking for a new equipment manager with the Huskies," she said, "and I was already planning on moving here to go to university." She made the move to Saskatoon a month early so she could assist with the Huskies' August training camp. "Sixteen years later, I'm still working with the team, so it must have been a good fit." 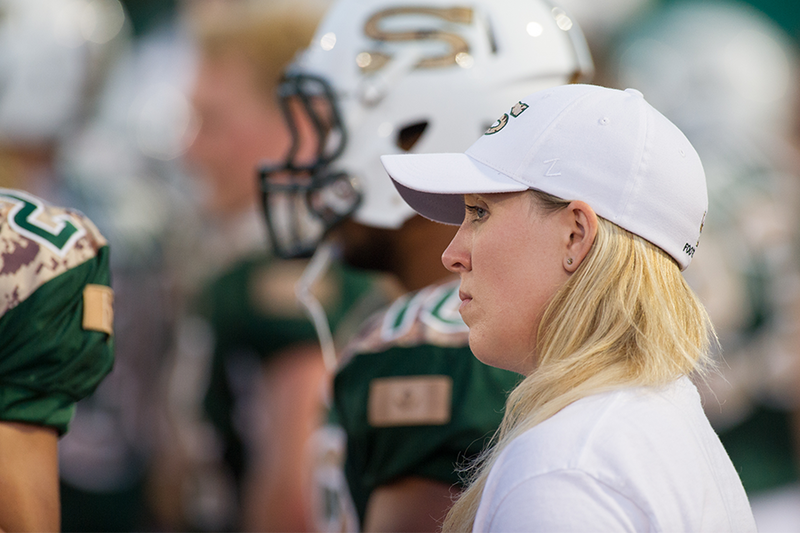 In her role, she ensures the athletes are properly fitted with their equipment and that it is functioning properly—from helmets to shoulder pads, knee pads to cleats. This also includes ordering the equipment and managing anything that requires repair. She also works alongside medical staff to make sure injured athletes are fitted with the appropriate pieces to avoid further injury. Oh, and laundry—"lots and lots of laundry," she said. Eccleston enjoys making a difference with the team, "not only with the equipment part of it, which helps them to excel on the field, but also as a support to the athletes." She has furthered that sense of community by volunteering more of her time with Football Saskatchewan and Football Canada, and was even certified this year as an athletic equipment manager. Still, Eccleston does not consider herself too much of a sports buff. "I'm a fan in a different way," she said. "It's tough to watch sports when you've been so heavily involved in a different aspect. Even watching football games, my friends will laugh because I'll be watching what I'm used to seeing on the sidelines rather than the game itself!"